Have you ever wondered why this is the case? Could the answer lie in our evolutionary history? If you have wondered something similar then you’re not alone, because scientists have recently started looking at that very question and some of their results are very interesting. For some time now, the scientific community have acknowledged that there are psychological benefits to exposing yourself to flowers on a regular basis. Some of these scientists are even going as far as to recommend that people who are stressed in their daily lives can alleviate some of their stress with “flower therapy.” It sounds crazy but there is actually some good evidence to back this up. One study in New York wanted to measure the effect on receiving flowers over certain other gifts like a pen or fruit basket. They thought that there is something special about flowers that other gifts, even those with a higher practical value, cannot match. They took 147 women and interviewed them before any gifts were given in order to gauge their baseline state. Researchers then noted the looks on the faces of the gift recipients when they received their gifts. Finally, a follow up was done 2-4 days after the giving of the gifts to see if there was any long-term change in mood. When presenting the gifts, the main thing the scientists wanted to measure was the number of genuine smiles. These are the “full face” smiles that indicate that someone really is feeling happy. 90% of participants receiving fruit and 77% of those receiving a candle gave true smiles, while 100% of those receiving flowers were genuinely happy to receive that gift. Several days later during the follow up calls, it was revealed that all participants had lower negative emotions, but only those who received flowers had an increase in positive emotions. So it seems that flowers do make a difference to your mental health, but the question is why? The answer may lie in our evolutionary history. It wasn’t that long ago that all of our ancestors lived and evolved amongst nature. It’s only been since the industrial revolution that most people began to live in cities. They lived in forests, jungles, the Savannah; all areas where you are surrounded by plants and flowers all day every day. Another difference between our lives and the lives of our ancestors is the amount and type of stress we face. Our ancestors had higher peaks of stress; coming face to face with a dangerous animal is about as stressful as things get. However, most of the time they had lower levels of stress than we do. Our problem with stress is that it’s chronic. Researchers in Japan found that one way to reduce our levels of chronic stress is through exposure to plants and flowers. They showed that it wasn’t just receiving flowers that could help us with our daily lives, but just being exposed to them can help as well. The research team took 30 office workers and exposed them to flowers for a few minutes. At the end of this period, it was found that they had, on average, a lower level of stress compared to the earlier state. They had lower levels of anxiety and there were even differences noted in their parasympathetic nervous system. So it seems that it’s not just your psychology that can be improved with flowers, but also your physiology. A lot of health problems in today’s society are caused by excessive stress. Heart disease is a good example of this. If exposure to plants and flowers can help reduce stress in the wider population, then it makes sense to try and use it to prevent the diseases from happening in the first place. Physicians are beginning to suggest to their patients that as well as traditional treatments, they should also consider therapies such as bathing in forests and spending time in city parks. Scientists believe that a small amount each day is beneficial, so you don’t need to sell your house in the city and live in a cabin in the woods to see some benefits. 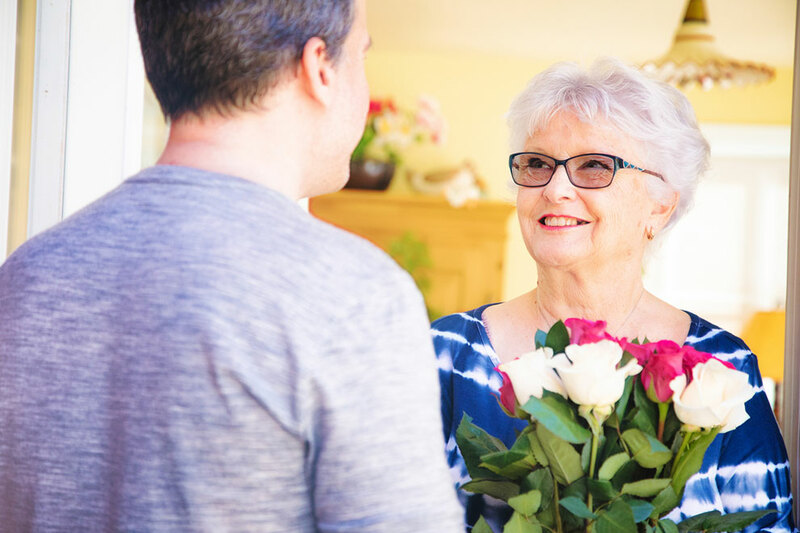 And if this isn’t possible either, at least you know that sending some flowers to a loved one will put a smile on their dial and leave them in a better mood for a few days. Only time will tell what scientists will discover next! What scientists have discovered is that surrounding yourself with flowers and plants out in the garden is not only a good hobby, but it is also good for your mental well-being. Our personal alarm system will still work outside in the garden, with a range of up to 100m, so if you have a fall whilst gardening you can call for help. For further information about the personal alarm service, please contact our friendly advisers on 0800 999 0400. Alternatively, you can complete our contact us form and a member of the team will be in touch shortly.